Capitalism and corruption are the main courses served in Elio Petri’s darkly comic Property is No Longer a Theft (La proprietà non è più un furto). When a lowly bank clerk (Flavio Bucci) is denied a loan, he goes on a nihilistic crusade against one of the bank’s customers, a wealthy butcher (Ugo Tognazzi) with secrets to hide of his own. Stalking him and taking small items of value, working his way up to the butcher’s mistress (Daria Nicolodi), the butcher is reluctant to turn him in, fearing that his questionable flow of finances could be exposed. The third film in his “neurosis trilogy”, preceded by Investigation of a Citizen Above Suspicion and The Working Class Goes to Heaven, this pessimistic but acerbic look at class warfare takes an unusual approach, giving us fourth wall breaking backdrops of each of our main characters interspersed with an eccentric narrative. Truth be told, I didn’t know much of anything about this film prior to viewing it. Because of this, it sometimes made it difficult to adjust to it. Since it doesn’t follow a conventional storyline (and partially due to it being presented in another language), it can be initially difficult to gauge. However, the performances and the cinematography are top of the line, as is Ennio Morricone’s brooding score, which has traces of what he would do later with the score for The Untouchables. Director Elio Petri’s take on what defines both the poor and the rich as thieves isn’t so much concerned with the story itself, so much as it is with ideas. Even the butcher’s mistress, who is a bridge between those two worlds, has her own subjective notions about her role in all of it, which I felt was worth further exploration. 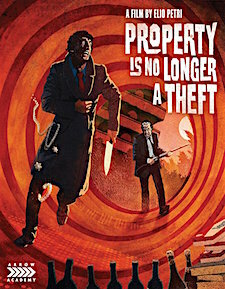 Regardless, Property is No Longer a Theft is a highly satirized window into a capitalist society begging for a revolution, but always coming up short. Arrow Academy’s presentation of the film features a transfer taken from a 4K restoration from the original camera negative. It’s a beautiful transfer with solid grain levels and excellent fine detail in all respects. Although the colors aren’t often bold, they are given their time to shine when they’re required to be. Black levels are deep and solid with excellent brightness and contrast levels, and there are no major film artifacts left behind. This transfer is also presented with a strong encode with no noticeable digital anomalies. The sole audio option available is an Italian 2.0 LPCM track with optional English subtitles that play automatically when starting up the main feature. It’s a strong but dated soundtrack, with excellent fidelity for dialogue and sound effects. However, I felt that the score (and this is likely due to the way that the soundtrack itself is mixed) sometimes takes more of a back seat than it probably should. It wasn’t a constant occurrence, but I wished that it could have been intertwined a bit more than it was. In any case, this is a gorgeous presentation of the film in all respects. The extras are brief, but well worth checking out. New interviews by the production company Freak-O-Rama are presented, including My Name is Total, an interview with actor Flavio Bucci; The Middle-Class Communist, an interview with producer Claudio Mancini; and The Best Man, an interview with make-up artist Pierantonio Mecacci. There’s also a DVD copy of the film and a 24-page insert booklet with an essay on the film by Camilla Zamboni entitled “A Grotesque Entanglement of Property, Power, and Desire”, as well as restoration details. More of an interesting art-house type film than a slick story-driven one, Property is No Longer a Theft requires a bit of a sophisticated film diet in order to make any semblance of it at all. It’s certainly not the kind of cinema that one dives into strictly for entertainment value. It has something more to say than what’s on the surface, but that surface can be a bit tough to burrow into upon first glance. Arrow Academy’s presentation, however, makes certain that there will be no distractions when one explores the comedic minutiae.